In many respects, Android is quite the complete OS, but even the most complex and carefully planned projects have weak spots. Stock Android lacks a competent built-in file manager, making it difficult to perform basic operations like moving files as well as more advanced tasks. Luckily, there are a plethora of file managers available for Android. 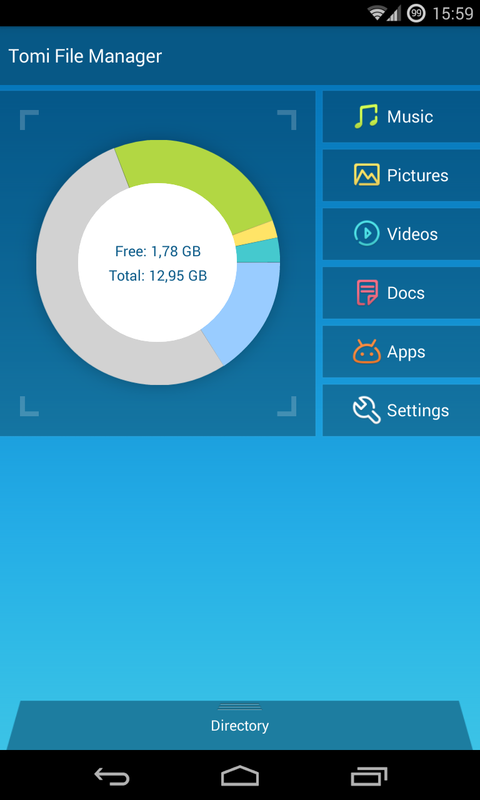 One such offering is Tomi File Manager by XDA Forum Member uuOuu. Tomi File Manager offers everything that would be expected from a solid file manager. It has a nice user interface, and it is able to categorize your files into music, pictures, videos, documents, and apps. You can also browse your files without categories if you prefer. The only glaring omission (for now) seems to be the lack of root support, leading to the inability to modify your /system partition, but hopefully this is added in a future build. The application is still in its beta stage, but users looking for a good non-root file manager can try it out nonetheless. You can obtain the APK file from the original thread.